and must not be reproduced in any form. Here Cathy was presenting a drawing to Juan Manuel Muñoz at Yeguada Cardenas. Juan Manuel rode Fuego de Cardenas in the 2012 Olympic games in London achieving 10th place in the finals. 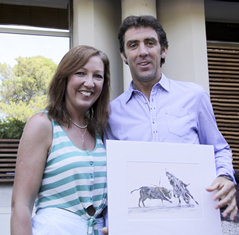 Here Cathy was presenting a drawing to Pablo Hermoso de Mendoza, one of Spains best rejoneadores. 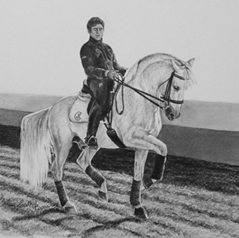 In the drawing he is riding Silvetti, a dark bay pure bred Lusitano. 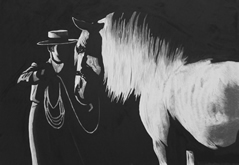 The pencil drawing Acoso y Derribo was in the final “faboulous 50” of the prestigious international competition “Artist of the Year 2012” run by the magazine Artists & Illustrators. 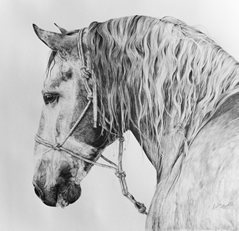 Terminando de Lavarlo II won the prize for the best drawing at the Society of Equestrian Artists annual exhibition in London. 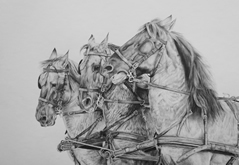 The drawing “Três sorraias en atrelados” won a Highly Commended prize at the Royal Bath and West show in England. Cathy also tried a new technique with her drawings, adding black watercolour to the pencil drawing, “Cobra de 8 yeguas” was the first of these pictures.